Questions that never end and are never satisfied. Anxiety that you’re being deceived or will be left. Frustration that you can’t trust anyone. Certainty that you’ll be let down and disappointed, again. Mistrust in your own judgment and perspective. This (and more) is what jealousy does to you. It takes away your peace of mind and attacks in stressful situations and even when you’re having a close and loving moment with your partner. Jealousy appears to be way beyond your control and leaves you feeling helpless and weak. None of this is good for your relationship or for your own well-being and, thankfully, there’s something can do about it. 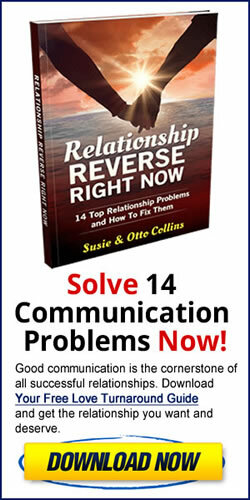 Hi, we're Susie and Otto and we're here to help you overcome jealousy and have the love and relationship you've always wanted. We're trained jealousy coaches but our biggest credential is that we conquered jealousy early in our relationship and have been passionately and happily together and married for 16 years. But it wasn't always that way. When we were first together and had our "soul mate" experience, we thought that would last forever. But when jealousy started creeping in and disrupting our beautiful relationship, we knew we had to learn the secrets and tools to stopping jealousy and keeping our love alive before it killed it. Today, jealousy is no longer an issue for us and our marriage is closer and more loving than either of us ever dreamed was possible and that's what we want to share with you. If we can do it, and our clients can do it, you can do it too! Learn how to stop your jealous thoughts and behaviors that are keeping you from having the love you really want. • How to stop being jealous of your partner's ex or "good friend"